There's more to Vegas than casinos and the Strip! Despite Las Vegas's reputation for its wild nightlife, there is more than one side to this bustling city. If you're looking for something a little different than the casinos, glitzy shows, and indulgent buffets scene, then explore the hidden side of Vegas. There's actually quite a bit of natural beauty, some quirky fun, and even some camping to be had in Vegas if you're willing to venture off the Strip to search for it. Here's a guide to the other, lesser-known side of Vegas! One of the most legendary attractions in the Vegas area isn't a casino... the Hoover Dam is an icon in its own right. Between the insane story of its construction, its incredible design, the fact that it has the ability to provide so much power to three states, and the views offered from every angle of the dam, it's an absolute marvel. Walking across the road atop the dam is a must-do, and if you can spare the time, the half hour and hour long tours that let you inside the dam itself are worth every cent! The Hoover Dam Museum dives more into the totally crazy story of how the massive structure was built. The dam's history has its roots in the Great Depression and FDR's plan of employing out-of-work men to construct government projects. Designing a dam as big as this was no easy feat, and construction was incredibly perilous. Conditions were extreme, with temperatures well over 100 degrees in the summer and below freezing in the winter, the work was dangerous, and about 100 men lost their lives working on the dam. The history of Boulder City is tied to the dam as well and between the old photographs, first-person descriptions of what it was like to work on the dam, the collections of artifacts, and the well-curated displays, this is a fascinating look at one of the most interesting stories Nevada has to tell. As you make your way into Vegas, the attractions get increasingly more quirky. The Pinball Hall of Fame is a totally kitschy throwback to the days when all you needed for hours of entertainment was a pocket full of quarters. Load up on change and stop in to re-live the good ol' days! Scores of vintage machines (and a super cheap popcorn dispenser) all await you here, and even if you aren't a pinball pro, it's incredibly fun to stroll among the rows of games and soak in all the kitschy goodness. Everything in Vegas is over-the-top, including their mini golf courses. KISS Monster Mini Golf is located inside the Rio, and it is quite an experience. Black lights, loads of neon, DJs spinning classic KISS songs, and fun putt-putt obstacles on the 18 holes make this a slightly ridiculous but incredibly fun (and, honestly, reasonably priced... for Vegas, at least) stop. It also serves as an arcade and museum dedicated to KISS memorabilia, so if you're a fan of the band, their music, or even simply an appreciator of their place in rock history, this will be quite the experience. A room in an expensive Vegas resort isn't the only accommodation option while you're visiting... Circus Circus has an RV park where you can set up camp in the comfort of your own RV. Within walking distance of the strip, steps away from all of the excitement that Circus Circus has to offer (including the world's largest indoor theme park and an arcade with free daily circus acts), and boasting amenities like patios with furniture for every site, a game room, a pool with a hot tub, a dog park, and tons more, it's probably the most exciting RV park in the country. Plus, if you happen to be traveling in an RV from Thor Industries, you'll be just as comfortable as you would be in a super expensive room inside the resort! Once you grow weary of the bright lights and high energy of Vegas, you can reconnect with nature right outside the city at Valley of Fire State Park. The red rock formations are just as dramatic as anything you'd see on the Strip, but in a natural and utterly breathtaking way. Ancient trees, mysterious petroglyphs, petrified logs, and more are tucked between the sweeping, rugged sandstone hills. 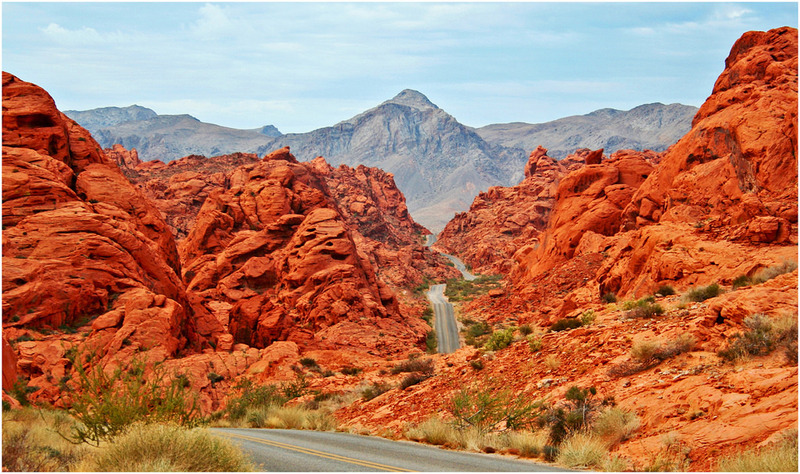 The drive out to the park is unforgettably beautiful, and the Valley of Fire itself is completely breathtaking. Hike to crazy formations like the Slot Canyon, Elephant Butte, and Mouse's Tank, and then camp out under the stars for a perfect end to your trip. From the hidden history of the Hoover Dam and Vegas's wackiest activities to the coolest camping right off the Strip and the prettiest natural wonders the desert has to offer, there's way more to Las Vegas than most people realize. It's filled with interesting stories, offbeat fun, and stunning outdoor beauty, all waiting to be discovered by anyone who is ready to head off the beaten path! Elephant Rock, Valley of Fire State Park, Nevada.